﻿ Notice: Undefined index: idsek in /var/www/vnews/htdocs/index.php on line 33 Notice: Undefined variable: pismo in /var/www/vnews/htdocs/index.php on line 59 Notice: Undefined variable: postrani in /var/www/vnews/htdocs/index.php on line 76 Notice: Undefined index: postrani in /var/www/vnews/htdocs/index.php on line 77 Notice: Undefined index: postrani in /var/www/vnews/htdocs/index.php on line 77 Notice: Undefined property: Novosti::$osPortal in /var/www/vnews/htdocs/lib/Novosti.class.php on line 977 Notice: Undefined property: Novosti::$osPortal in /var/www/vnews/htdocs/lib/Novosti.class.php on line 1005 Notice: Undefined variable: idesek in /var/www/vnews/htdocs/sadrzajmodula.php on line 7 Notice: Undefined variable: sirokiSablon in /var/www/vnews/htdocs/index.php on line 140 Thailand’s political crisis: Time up for Thaksin? General elections are widely seen as the answer to Thailand’s crippling political impasse, though Yingluck Shinawatra’s embattled government may be removed through either judicial or extra-legal means regardless of her performance at the polls. 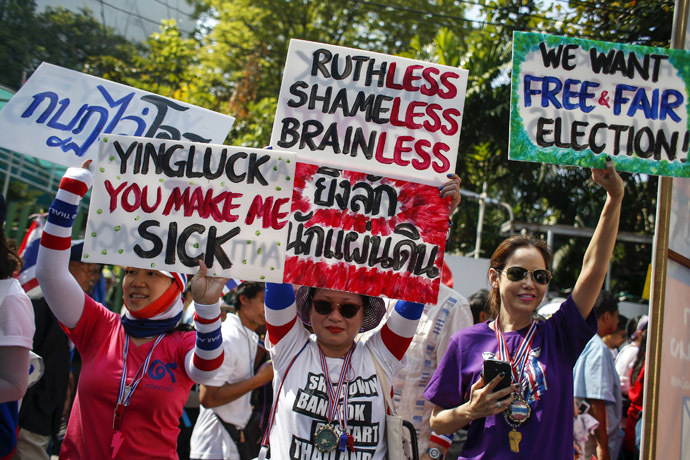 Protestors calling for the ouster of Thailand’s caretaker Prime Minister Yingluck Shinawatra disrupted the February 2 polls by obstructing traffic and blocking access to voting sites, forcing authorities to postpone further voting until a later date is decided upon. 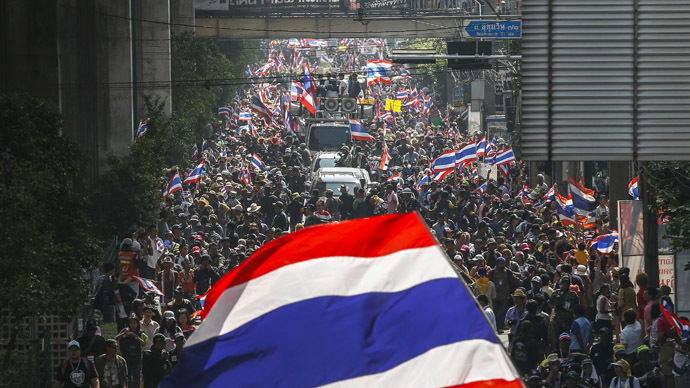 Thailand has been marred by political upheaval since November, and the country’s two rival protest movements accuse each other of launching anonymous attacks on one another, usually by targeted shootings or by the use of small explosives, leaving several dead. The consensus of independent analysts and others who have monitored the attacks suggest that they were mostly launched by government supporters, who have used insurgent tactics in the past to support the Shinawatra political clan. 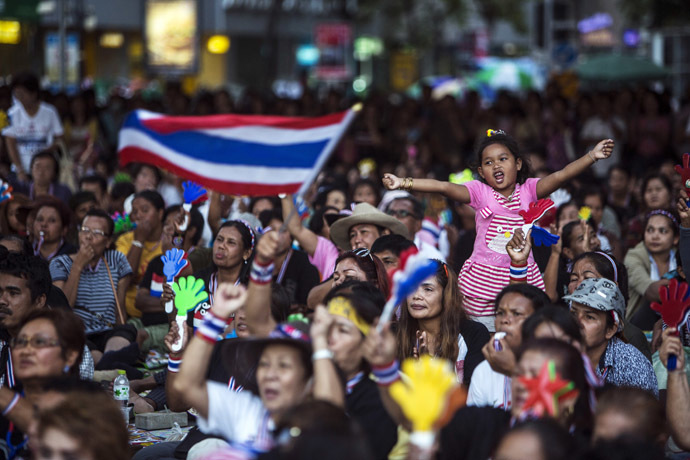 Thai political movements have been characterized in recent times by color affiliations. Protestors wearing yellow shirts represent the faction aligned to the all-powerful Thai monarchy and the royal establishment that has traditionally wielded tremendous social, political and economic power over the country. Yellow shirt demonstrators typically come from the established middle class, and in the present scenario are aligned with the People's Democratic Reform Council (PDRC) protest group. Protest leader and former Democrat Party Secretary-General Suthep Thaugsuban has mobilized massive numbers to clog Bangkok’s streets and occupy government ministries in a bid to force Yingluck's resignation and purge her family's influence from Thai politics. Protestors wearing red shirts represent supporters of Yingluck Shinawatra and her brother, former PM Thaksin Shinawatra, who was deposed in a 2006 military coup. Thaksin, a billionaire businessman and telecommunications tycoon, lives in exile in Dubai to avoid facing criminal charges and arrest in Thailand for the deep-rooted corruption that occurred during his tenure as prime minister. Supporters of Thaksin are aligned with the United Front for Democracy Against Dictatorship (UDD) protest group and typically come from Thailand’s rural north and northeast, regions that have benefited most from populist policies and transformative medical programs, culminating in steadfast support for Thaksin-backed political parties that have won every election since 2001. Thaksin’s tenure as prime minister saw business interests and wealthy politicians vie for control over commercial interests as they asserted themselves against the military hierarchy, who are regarded as defenders of the monarchy. Though the military were more likely motivated to move against his government in 2006 because Thaksin was promoting his loyalists and working to reduce the military's political and economic muscle, his style of leadership can be likened to running Thailand as a family-business, making him one of Asia’s richest men in the process. Thaksin's family and political confidants attempted to dominate all sectors of the economy and state, and ruled as if they were above the law. While it’s true that Thaksin-backed parties are the only political force in recent times to uplift the rural underclass and give them some measure of political representation, electoral benefits were the clear motivating factor as these policies ensured the continued perpetuation of Thaksin’s family-rule through the ballot box. Red shirt supporters of Thaksin generally acknowledge his clear vested interests, but feel that they at least benefited through social policies of virtually free healthcare, attractive student-loan schemes, and land redistribution. Thaksin arguably remains the de facto prime minister despite being a convicted fugitive in exile from Thailand since 2008. Officials from Yingluck Shinawatra’s ruling Pheu Thai Party have conceded to foreign media that Thaksin formulates the party’s policies and makes most of the important political decisions by constantly keeping in contact with the government in Bangkok using Skype and various instant messenger services. 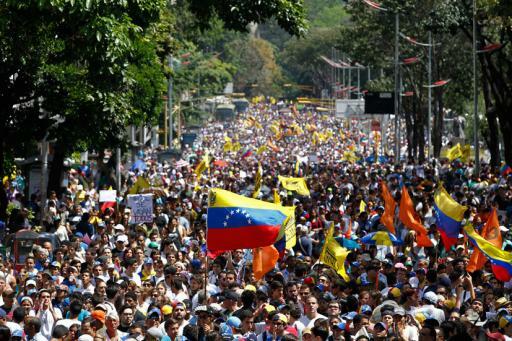 The current wave of protests erupted in November, when Yingluck pushed for a blanketing amnesty bill to pardon anyone facing almost any charge arising from period of political crisis from 2004 to 2010, allowing Thaksin to return to Thailand while whitewashing his criminal corruption conviction and other pending cases against his family members and political allies. The bill was met with mass outrage from anti-government protestors and opposition supporters, reflecting how Thaksin’s return from exile is still deemed as non-negotiable by royalists and traditionalists, even considering Yingluck's deference to royal authority and her notable non-intervention in military affairs. Personal and social relations in Thailand are overwhelmingly dominated by Theravada Buddhism and, by extension, notions of Buddhist philosophy have shaped political norms. The concept of the Middle Way calls on one to live moderately between the extremes of excessive indulgence and abstinence or self-abasement, which cultural analysts say has contributed to the cycle of moderately corrupt traditional elites who have come and gone without clinging to their authority or excessively enriching themselves since the end of absolute monarchy in the 1930s. Thaksin Shinawatra is so vehemently rejected by large sections of society because his rule has violated the norms that Thais have come to expect from their political leaders, primarily because of his attempts to cling to power and continually dominate the state and the economy despite his fugitive status, thereby undermining the position of the military, and by extension, the monarchy. For this reason, the suspension of democratic formalities to uproot Thaksin’s faction is more-or-less politically acceptable to a large section of society. Thaksin’s political clan has attempted to downplay beliefs that he is a perceived enemy of the king, who wields enormous influence over Thai society, acting as its moral backbone and a politically neutral (but peerlessly powerful) leader. Followers of the PDRC and its leader Suthep Thaugsuban seek nothing less than purging Thaksin’s family from political power by forcing Yingluck into making an unconditional resignation, threatening even to detain her and fellow cabinet members if she does not quit. 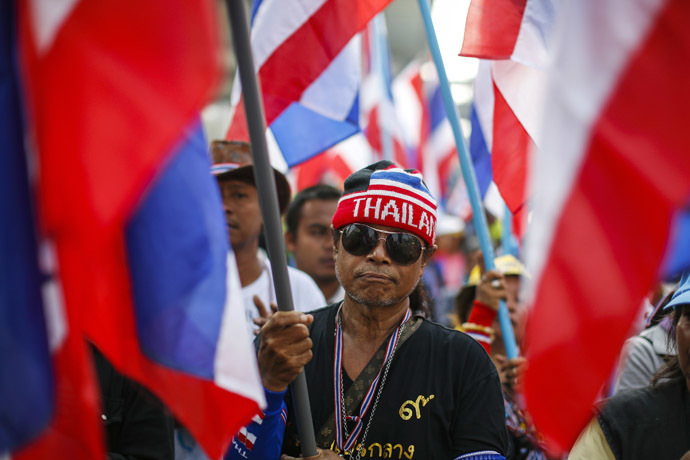 The opposition Democrat party – which has not won an election in more than two decades – backs the PDRC, both of whom boycotted the February 2 polls and endorsed the protest movements that disrupted it. The PDRC wants an unelected ‘people’s council’ to replace the democratically-elected government for a period of up to two years, allowing it to usher in reforms designed to permanently nullify Thaksin’s power and influence, perhaps by nationalizing Thaksin-owned businesses to send a message to Yingluck’s political allies. Suthep’s movement is extremely well funded by the anti-Thaksin business and political elite, and backed by powerful forces in Thai society that want to restore the traditional order under the guise of vague democratic reforms. Suthep also has a legacy of corruption that forced him to surrender his seat in parliament and is implicated in murder charges for a brutal crackdown on protesters in 2010 during his stint at deputy PM in a non-elected, military-supported government led by the Democrat Party. Suthep has a warrant out for his arrest after being charged with insurrection when his protesters occupied government offices, but the police have made no attempt to arrest him, an indication that powerful forces support his movement. From a macro perspective, the political stalemate in Thailand is a struggle between two business enterprises vying for political control over the lucrative national economy for personal gain, and the government side is quickly running out of options. Thaksin and Yingluck sought to counter the protest movement against their rule by opting for an immediate electoral solution, despite warnings from the country’s Electoral Commission not to hold the polls over security concerns. As expected by many analysts, the February 2 elections have ended in disarray, and even if the government can organize additional rounds of voting, establishment-aligned agencies and courts will likely declare the results null and void, fueling momentum for the PDRC and Democrat Party to force Yingluck’s resignation. In addition to facing mass opposition protests, Yingluck’s government is marred by a scandal linked to its populist rice-price support scheme, resulting in massive financial losses that prevent the government from compensating over one million rice farmers for their yields. The scandal has created resentment against the government in Thaksin’s traditional strongholds, and may very plausibly lead to Yingluck’s impeachment and the dissolution of her Pheu Thai Party. 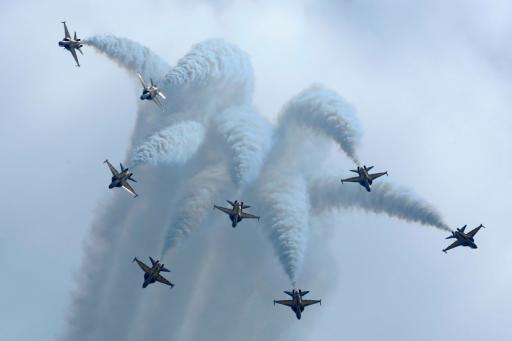 The PDRC ‘people’s council’ would face many obstacles if Yingluck were toppled by a military coup that would prevent the new government from being internationally recognized, so her eventual removal will come through either judicial or extra-legal means and the PDRC would likely usurp authority in the ensuing power vacuum, legitimized by mass people power. The biggest immediate concern facing Thailand is not the suspension of democratic formalities, but the backlash from Thaksin supporters, some factions of which have vowed to respond with violence to any attempt to remove Yingluck; any drawn-out insurgency campaign would threaten the integrity of the Thai state. After years of political upheavals and attempts to cooperate, the two rival political factions appear unwilling to compromise and the Thaksin sibling pair is short on survival options. The aristocratic opposition has traditionally been unconcerned with rural uplift and the kind of social programs that Thaksin-backed parties brought to the table, and if the royalist-establishment cannot find an answer to the rural question by introducing policies that empower the pro-Thaksin electorate, deeper class divisions may become a defining obstacle to stability in Thailand.